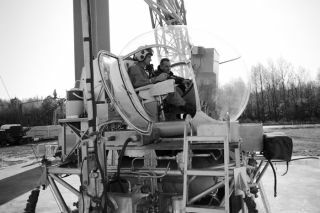 An astronaut in training on the Lunar Landing Simulator in 1965. In this historical photo from the U.S. space agency, Astronaut Roger B. Chaffee (left) receives instruction from Maxwell W. Goode, a scientist at NASA's Langley Research Center. Goode is explaining the operation of the Lunar Landing Simulator at the Lunar Landing Research Facility.